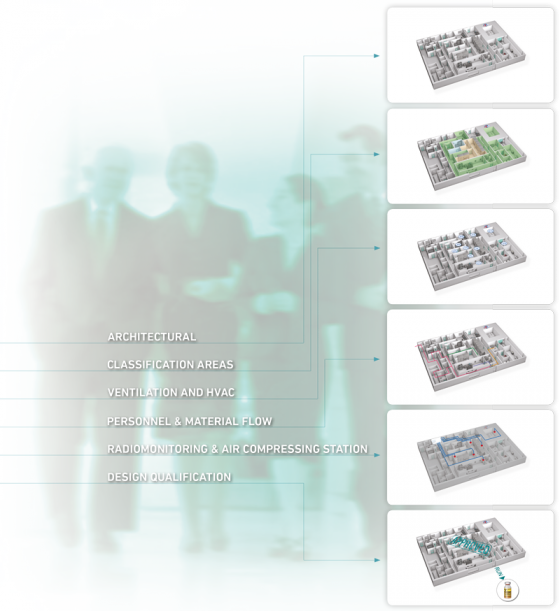 One objective of the 1MP service is to customise and optimise new or existing facility layout and site planning in compliance with GMP standards including architectural and engineering services such as heating, ventilation and air conditioning (HVAC) design. Everything is closely supervised in accordance with the User Requirements Specification which provides the general engineering requirements for the design, construction and operation of the facility, considering GMP guidelines, design constraints imposed by the context in which the laboratory will be set, business strategies, and flexibility for future expansion. The entire process will be controlled in order to provide a correct management and verification of the laboratory performance, bearing in mind the defined specifications and “providing in accordance with the principle of Good Manufacturing Practices, that any procedure, process, equipment, material, activity or system actually leads to the expected results”.